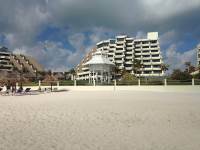 Royal Service at Paradisus Cancun is a private area of the all-inclusive Paradisus Cancun resort. 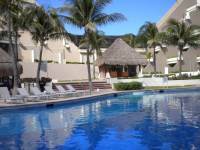 It offers a large pool, 3 hot tubs, a private beach area and a terrace overlooking Nichupté Lagoon. 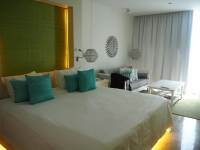 The stylish air-conditioned suites and apartments feature LCD cable TV, free Wi-Fi and a private terrace. 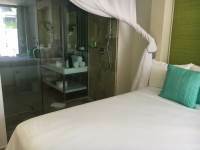 A coffee maker and a minibar are provided, while bathrooms come with a hairdryer and bathrobe. Royal Service at Paradisus Cancun features a private lounge which serves continental breakfast and drinks and snacks throughout the day. Sun cream, aftersun and parasols are provided on the poolside. Royal Service guests are guaranteed preferential reservations in the resort’s Yhi Spa, golf course and 9 on-site restaurants. Butler service and 24-hour room service are also provided. 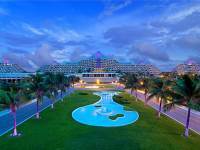 The resort is located in the Hotel Zone, a 20-minute drive from Cancun city centre and from Cancun International Airport. 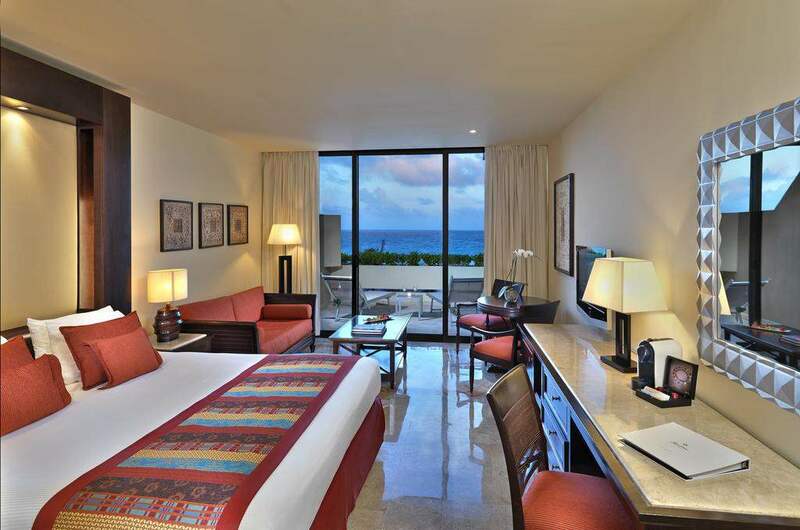 Playa del Carmen is a 45-minute drive away. One of my best family vacation time. 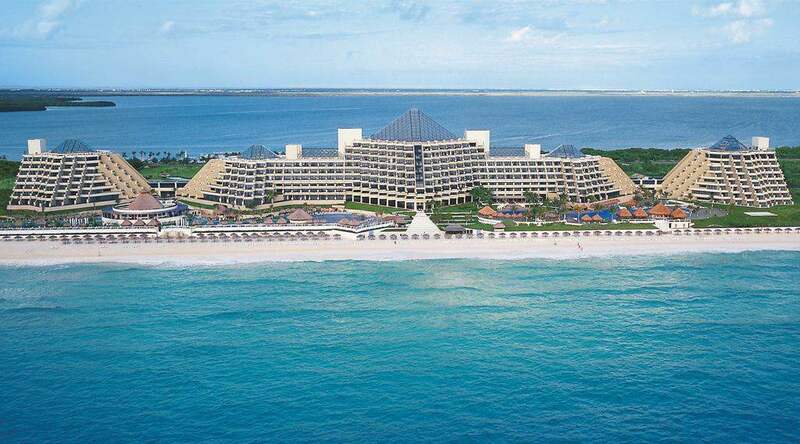 I must say we will be returning to Paradisus Royal Service, Cancun. It was by far our best vacation ever. The food, service, and relaxing atmosphere was top notch. I highly recommend to anyone debating staying at this resort! Everyone is super friendly and always willing to provide excellent customer service. We have zero complaints about our entire stay at the resort. Best Vacation We Ever Had! 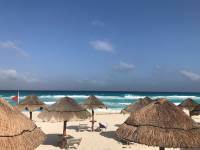 My son, who is 20 years old, and I went to Paradisus Cancun from 8/7/17-8/12/17. We had ocean front view with Royal Service and a butler. The room was a nice size and very clean. The whole resort is very clean as well. We had two double beds and they were very comfortable and it was cool in the room. They treated us like royalty. Our butler Edwardo did everything possible to make sure we were happy. We were in the Royal Service building which is building number 5. The resort is large but all the buildings are attached and you eventually figure out your way around. Our butler made our reservations, reserved the Balibed, showed us around, helped us book excursions, filled our room up with our favorite snacks and even brought an x-box 360 to our room when he found out my son liked to play video games. 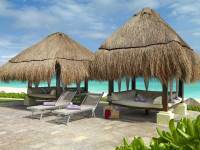 Royal Service vacationers have their own restaurants, beach and pool. Everyone is SUPER nice. The waiters, even by the pool, were very attentive and made sure we didn't want for anything. Offering us drinks and food. They even cleaned my eye glasses and left ice buckets with bottles of water in them. The restaurants we went to were delicious. Our favorites were Lapalapa and the Japanese restaurant. The shows were good. The ONLY negative thing I have to say is that when they had the shows inside it got very hot because there was no air conditioning. My son encountered the same problem at the Red Lounge. Other than that NO complaints. My son went jet skiing in the lagoon across the street. It is called Aqua World. Just to let you know they have crocodiles in the water. We were there for Tropical storm Franklin. Jet skiing was only available in the lagoon until the sea calmed down. We went on one excursion which was a 40 minute ride from the resort. It was zip lining, Atving and swimming in a spring for the day. We had a very nice time. My son and I enjoyed riding on the ATVs and swimming in the spring the best. The highlight of the vacation for me was going on the beach at night and watching the sea turtles come on the beach to lay their eggs. It was an amazing sight. The biologist watch for them 24/7 and they dig up their eggs and put them in a fenced in area where they label what kind of turtle layed the eggs, how many eggs and the date. Once they hatch they put them in a crate turned upside down and release them at night into the sea. We felt safe at all times and truly had a great vacation! Next year Paradisus Royal Service Punta Cana. The Royal Service is worth the money. As a couple, we went in August for a week. 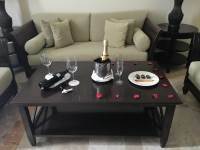 We did all the reservations for restaurants and bali beds in advance. 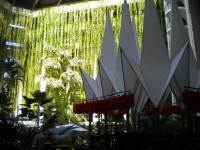 The adult only area and pyramid are very well maintained, the staff are all pro, attentive and helpful. 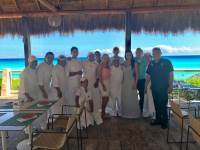 I can't name them all, but we got exceptional service from Concierge: Monsserat, Melina; Butler: Rossana, Hector; At the Pool and the LaPalapa restaurant that is special for the Royal service guest, I'd name Carlos, Jose, Valeria, Octavio, Cesar, Erric.. many more, they are ALL good and they go out of their way to pamper you. Tips always welcomed and very well deserved. Don't miss the Spa area, great place! I spoke to the manager for the little coordination glitches just to improve it and have a great experience. We will be back soon! Thanks to all. 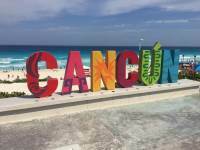 My mom and I travelled to Cancun and stayed at the Paradisus Cancun for 7 days in late July, early August. We were upgraded to Royal Service and were not disappointed!Although on the ground floor, we were incredibly happy to have the small perks that come with the Royal Service package. Adults only, unbeatable service, and pure serenity. Having ventured out to the main building only once for breakfast, we were pleased to be in Royal Service where it was much quieter and calmer. We were looking for a relaxing vacation and we got exactly that. The staff went over and above to make our stay pleasant and all that we wanted it to be. Victor and Eddier were two exceptional members of the staff. They were extremely attentive and authentically kind. 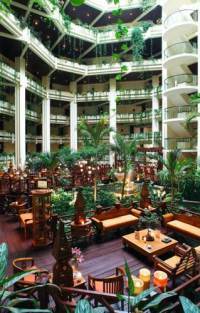 The overall ambiance of the resort is very zen and immaculately clean. Our room was beautiful and cleaned twice a day with a stocked fridge and fresh towels. Francisco from the Avenue Bar was a gentleman offering up delicious drinks my mother and I had never tried before. 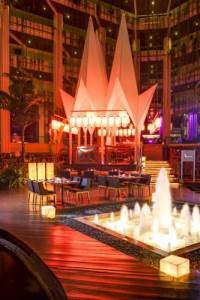 There is not much entertainment but there is a lounge/club that offers up late night dancing in an enclosed AC space. We would have liked some dancing options outside of the club but we were so pooped from being beach bums that we didn't mind just hanging out and people watching in the evenings. The restaurants are OK. Two in particular are excellent, while the others are seriously lacking. 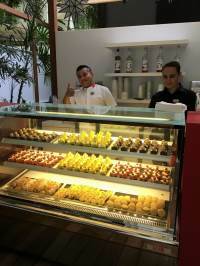 Bana and Vento both offer delicious options that are a good alternative to buffet eating. We went to each restaurant twice throughout our stay. La Palapa in the Royal Service section was our top choice for breakfast. They also served up snacks during the day that would be delivered right to us on the beach or by the pool. Overall, if you can stick to those 3 restaurants you will not be disappointed. 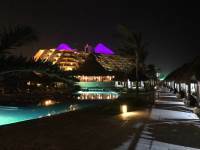 We are so happy to have exoerienced Mexico for the first time at this resort. We are looking forward to returning and exploring more outside of the resort. Sidenote: the waves were very strong 5 out of 7 days we were there. Given that my mother isn't a swimmer, it was a bit disappointing but still beautiful to look at!! AMAZING... ROYAL SERVICE - Where you NEED to be!!!! See my original post...but all I can say is AMAZING. You must do Royal Service. It isnt event that much more expensive. The value you, you receive is way more than what you pay. I can't see myself traveling any other way. Some of the furniture (outside of royal service might I add), was a little dated, but our room was amazing, and the majority of the property is really nice. See my pics! 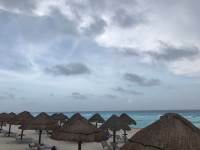 Staying in the Royal Service section at Paradisus Cancun for a week was like living in paradise! I don't want my vacation to end! 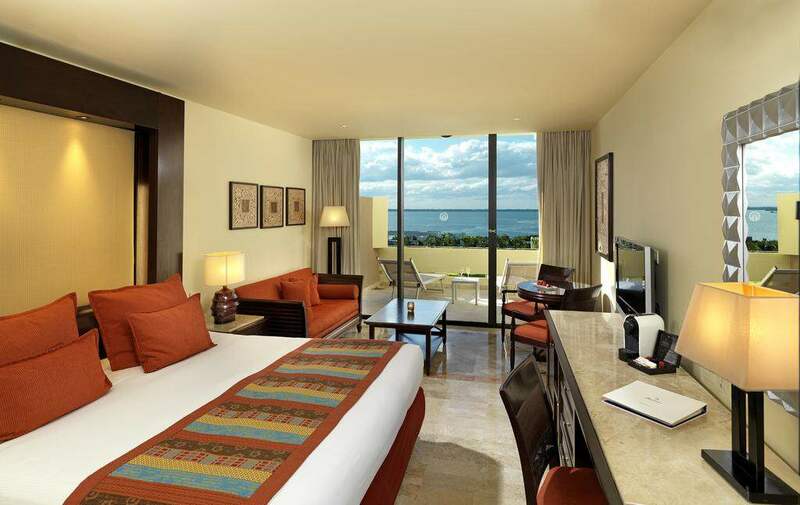 If you're looking for something on the quieter side, then Royal Service at Paradisus Cancun is for you. 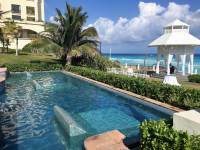 You get to enjoy the private beach and pool area for adults only with exceptional service. Carlos, the guy around the pool area/bali beds, is awesome. He's attentive, genuinely cares for everyone there, and he makes sure that your needs are met! This place wouldn't be the same without him. The best part of Royal Service is that you get to eat breakfast and lunch at La Palapa, which is exclusively for Royal Service guests. Instead of eating at the buffet (where it's crowded), you can eat at La Palapa, which also has a great view of the ocean. By the way, this place has the best waiters, and the most amazing pancakes and omelettes. Joel de Jesus Rojano is one of the awesome waiters who works there. He goes above and beyond to make sure you're happy. Joel also has the best recommendations for breakfast and lunch, depending on the type of food that you like. You definitely won't regret eating there. Thank you, Carlos and Joel, for making this a memorable experience. 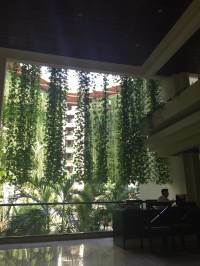 My wife and I arrived here Sunday for a week vacation, we contacted the hotel concierge prior to arrival and Monserrat, helpful and professional concierge, made all our a la carte reservations for each day, bali beds, had our room ready on arrival. Our butler Rossana, all help you can ask for, small or big, she takes care of it for you with a smile. Carlos by the pool, is the name to ask for when you need anything and he will make it happen. Also, Joel, Hector, Melina, Valeria and more, all great people and just want to pamper you. One day my wife was getting a fruit and cheese plate and Octavio escorted her out to the pool holding the plate, you just feel pampered on every level. This is our day 4 here and we are still looking for more fun. We had an incident at the Mole restaurant the other day, but the manager did all her possible to make us happy and served us herself, she even brought the chef so we complimented him.Andrea at the entertainment center, she is such a sweet young lady, she came to our bali bed to teach us Spanish, so helpful. Cesar at La Palapa by the pool, he goes out of his way! Kudos to all, we are celebrating our birthdays and still we are continuing to have fun... Will write more as we go! I have spent 2 days in Parasdise!! Visited May 2016 for a Conference next door. Great service in the Royal Service Section. Bali Bed prepared daily. Attentive Butler. Treats in our room before dinner nightly. Butler drew us a each a rose petal bath which was wonderful. Quick service. Amazing food. Self serve bar in royal section was neat. Beach was gorgeous. Overall 5 star vacation. Royal Service was everything we expected and more! 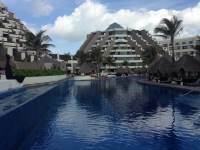 I returned to this resort in October after having a bad experience in 2013. I got a great deal and decided to give them another try and I'm so glad I did! The resort now has a new GM and it shows!! We arrived at the resort and were greeted with cool scented towels and promptly escorted to the royal service lounge where we were checked in and given a welcome cocktail. 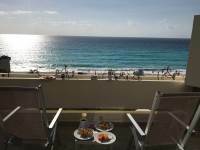 ( I had emailed the resort and informed them that we were celebrating our wedding anniversary and my birthday and requested an upgrade for an ocean view room but they were all booked up. never hurts to ask!) Our Butler Cesar escorted us to our room where they had champagne and strawberries waiting for us and rose petals everywhere! It was so beautiful! We were told that our stay included a cabana for 4 days out of the 7 and we ended up getting one for all 7! The third day we were there Cesar called our room to tell us that they were upgrading us to an ocean front suite! He came and helped us move everything to our new room and the view was AMAZING! 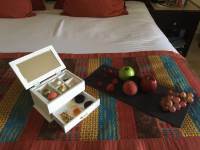 Throughout our stay we received special treats delivered to our room daily. We asked for a bottle of tequila and Cesar brought us big bottles of tequila, vodka and rum which we ended up taking home with us. On my birthday they left a delicious little birthday cake in our room and Cesar found me down by the pool and gave me a personal gift which was so sweet. He is the best!! We ate at all of the restaurants and never had a bad meal. Everything was delicious and the service was the best I've ever had from any resort I've stayed at. We took $300.00 in cash for tips and I wish we had taken 500.00 because these people are some of the hardest working people I've ever met and they deserved every penny. Everyone we encountered was polite and eager to make our stay fabulous. Royal service is well worth every penny. Don't wait, book it!! We will definitely return! 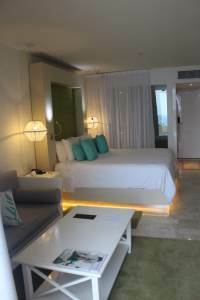 Had an absolutely amazing stay at the Paradisus Royal Service. 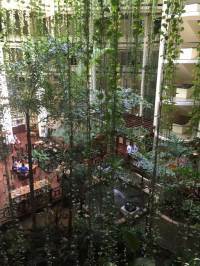 What really made this hotel stand out was the outstanding service. Hector our butler was very attentive, checking on us regularly to be sure our stay was going well and promptly took care of any of our requests. Joel and Valerie, our servers at La Papala provided excellent service and friendly conversation with lunch each day. Moise the bartender in Royal Service would have our drinks ready as soon as he saw us and have them refilled before we were ever empty. Carlos at the pool went above and beyond to make sure we were well taken care. He truly made our stay amazing and can't thank him enough for all he did. We enjoyed the entire staff, everyone was friendly and thoughtful. 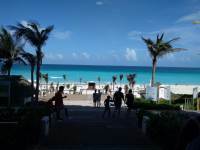 The resort is beautiful, the food is very good and the beach is stunning. You will not be disappointed staying here! 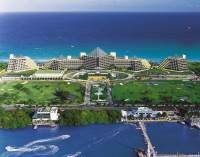 I arrived July 8th for 8 days staying in Royal Service at Paradisus Cancun Royal Service. Combination business and pleasure. Every morning I start the day off with Joel de Jesus Rojano. Joel is a great waiter-attentive, helpful, always available, and brings service with a smile. A gentle man. As a former waiter who eats all over the world, I know I can be demanding of good service, but I am always quick to recognise a gem. Gracìas a Joel for giving my mornings a pleasant start. He makes Royal Service authentic. You need more Joels. We booked the royal service after reading tons of reviews here on Tripadvisor. The royal service is located in building #5 where you need your room key to get access to the building. 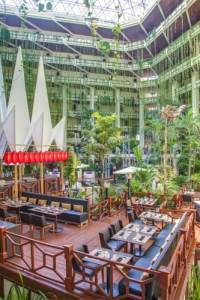 On the ground floor it is a courtyard serving light breakfast from 6am to 11am. After 11am, it serves a full bar with light refreshments until 11pm. The royal service also comes with a adult only private pool with cabanas for the guests. Our group of 6 adults were looking forward to the personalized butler service but it turned out very disappointing. Our butler is not attentive at all and we hardly see her around. She booked our 4 nights restaurant reservations but one didn't actually booked but luckily the restaurant was not busy at the time we arrived so we were able to walk in. To make the long story short, we didn't feel the butler was there to provide a personalized service which we were looking forward to. Towards half way of our trip we decided to contact the front desk ourselves to get what we need and end up we had better lucks getting a prompt and responsive services. I wouldn't suggest the royal service unless you prefer a quite pool without kids running screaming around. Other than that, all the personalized services the butlers promised to offer you can simply do it yourself with few phone calls. Another disappointing experience with the royal service was that we called the front desk for direction to the Marina Aquatours and the royal service front desk lady (Veronica) has told us it is directly across the resort. But, actually it is 7.5 miles (20 minutes taxi ride) from the resort. Thank you Google Map and thank you to myself just to double check, otherwise we would've missed our tour. Other than the sad disappointment from the royal service, the resort is nice overall. 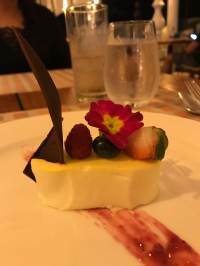 I gave big thumbs up to Vento and Market Grill, two of the best restaurants you must try at least once. We absolutely loved our stay at the Royal Service. Eduardo was our amazing butler. He spoiled us! Eduardo truly takes his job seriously and makes sure you are totally taken care of. We enjoyed the entire staff, they were all so friendly and thoughtful. The restaurant and bar service by the pool were our absolute favorite place to be. The facilities are amazing, the location is so beautiful and it is so relaxing! We started talking about our next visit while we were still there. We can't wait to return in November. This vacation was a rock star for us and it was all because of the Royal Service Team! Thank you so much! Wow! What a holiday!What a great holiday! What a great Hotel. What a great team - from the bar staff, to the pool staff (Carlos) to Hector (our Butler) and the whole of the Concierge team especially Veronica. Check in:Fast and very personal in the Royal section of the Hotel. Introduced to our Butler - Hector - who detailed his role and showed us around the complex. Very respectful and a great team player. Supported us throughout the stay making bookings in restaurants and day trips. Rooms:Clean, spacious, fitted with mini bar that was refilled daily at absolutely no additional cost. Room service was a bit slow on the two occasions that we used it.Food: Plenty of choice of specialist restaurants and in addition the Buffet restaurant. Food was 10/10. The Royal breakfast and snack area was brilliant and very convenient on the two early starts that we had during the stay. Pool/Beach:We used the pool and beach allocated to the Royal customers . Bali beds arranged by Hector/Carlos. Service was excellent and always respectful. Snacks always plentiful and delicious. Carlos at the Pool provided great support to any of our requests.SummaryGreat Hotel, will hopefully return soon! 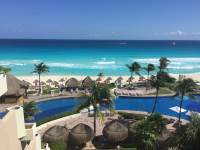 Here is my letter to Melia:To Whom It May Concern:As I stated on your Facebook post, we are repeat guests at the Paradisus Cancun, always staying in the Royal Service side. This past trip was our 5th stay with you, so we knew what to expect and looked forward to many of the comforts of coming back to a place we love so much. 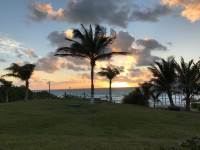 We are also MeliaRewards members, and know they receive a few extra small perks.I reached out to Larazo Asencion about a week prior to our trip, as I had done the previous stays. I informed him of a few small requests, and our arrival time. 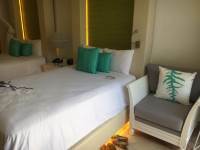 As it was an early arrival (10:30am) I did not expect a room to be ready, but I kindly requested a Bali bed as we planned to get into the resort and take a nap by the pool before we would be shown our room. Amazingly enough, our room was ready when we arrived, which was a pleasant surprise! We also requested a specific butler, Daniel C, who was also available during our trip. So far so good! Our dinner reservations at Market Grill were also confirmed for that first night, as was also requested.Previously we had always received a room upgrade (the last trip, at the end of November, we had a FANTASTIC room in Pyramid 4, more on that in a moment) but we were not offered one this time. Not a big deal, but since all of our other trips had this added feature, we were slightly disappointed not to have it offered this time. The reason we received such a splendid room at the end of November was due to Pyramid 5 going through upgrades and being closed. Had we known that prior to booking, it may have changed our minds, and we commented to such, so they generously upgraded us and our other party to better rooms - we landed into a beautiful suite with two balconies. 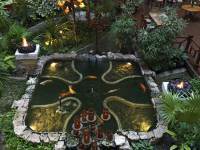 Again, since we have been here before, there were certain small comforts we were looking forward to, such as a relaxed breakfast in the atrium in Pyramid 5 every morning, watching the fish swim while we enjoyed a cappuccino. Its the little things. 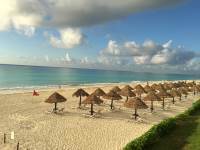 I had gone on TripAdvisor to read the most current reviews of Paradisus before departure, and I learned that the sister property, M by Melia, was under renovation and that guests were being switched to Paradisus. 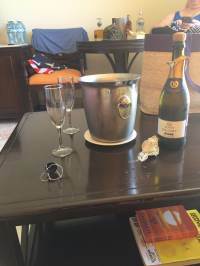 None of this really worried me, as in our previous stays we’d never received anything less than outstanding service, regardless of how busy the resort was. This time, however, was different. Even though we had our requested butler, we hardly saw him. His shift was totally opposite the times we were in the resort (we like to go off-site for shopping in the afternoon and dinner), so any needs or wants we had during the day had to be handled by other butlers. Thankfully, because we were repeat customers, many of the butlers knew us and gladly helped us out (the tips certainly didn’t hurt either). It was not what we had expected nor what we were used to. It’s not the Royal Service we were accustomed to. We spent the majority of our stay out by the pool, and I have to give a huge thank you to Eddie and Valeria - they are EXCELLENT at their jobs, and always go above and beyond. They received a larger tip at the end of our stay than our butler, only because they actually did more and took better care of us. I’m not laying any blame on Daniel, he didn’t have control over his schedule, but he had too many guests to properly take care of ANY of his guests. I watched him attend to at least 8 other couples when we were lounging at the pool - previously I had only ever seen him with 3 or 4. Clearly he was overextended, and to this I blame management. Truthfully, ALL the butlers were - I never actually saw anyone stop and have a real conversation with their guests, it was always very short, and then they’d run off to the next guest. This was part of the Royal Service experience that disappointed the most - the butlers typically spend time with their guests getting to know them so they can take better care of them, but that’s not possible when you have too many guests to take care of. They are obviously short the number of staff they need to properly cater to their guests. We did not let the above situations dampen our trip, though. 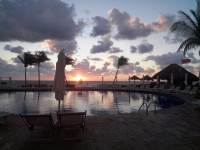 We enjoyed our time by the pool, and we enjoyed the new menu outside in the Royal Service restaurant, La Palapa. It was MUCH better than our past experience, and we actually ate lunch there more this trip than we did any of our other trips. 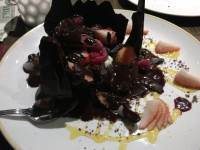 The quality and freshness was evident in every dish. As always, the cocktails and drinks by the pool were also wonderful. The food inside at the Royal Service “snack” area also saw an upgrade - we thoroughly enjoyed the new additions of jalapeño poppers and other warm foods in the early afternoon. Previously it had always been meats, cheeses and fruits, these casual snacks were the perfect accompaniment. So, in conclusion, although we love Paradisus, we feel our last trip there has made it evident it may be time for us to try some place new. We love Royal Service, but until they hire additional butlers, we feel we are not getting the true “royal service” that is advertised. Please do not hesitate to reach out to me with any additional questions you may have regarding our last stay, or any of our 4 previous visits. 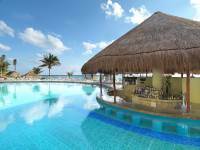 ********* I loved Paradisus but I will be looking at other resorts for our trip in September. 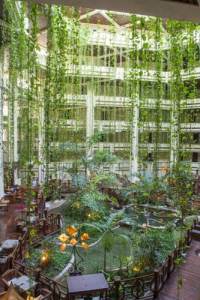 This is an amazing hotel with all services one can only dream of. 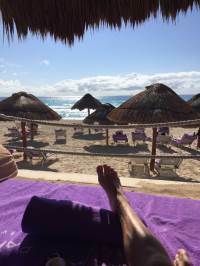 Breathtaking beach amazing spa ( I had VIP package with unlimited hydrotherapy),delicious food, the most attentative and caring staff( I am so grateful for our butler ,Eduardo , help and assistance), lake size pools. It is a dream vacation place except one thing you can't swim in the sea where this hotel is located. I repeat: CANNOT. 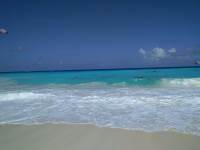 It's located in the open sea area and the waves, sea pull, underwater currents make this part of the beach absolutely life threatening,dangerous to go to. The flags were red ( dangerous to swim) for entire stay. I didn't know the hotel's specific location and wasted 5 days hoping for the wind and waves to calm down. So stupid! Finally,local people suggested beaches with calm water and we saved our vacation. 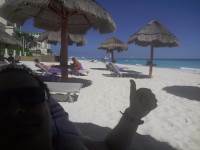 We used public transportation ( very safe,easy and reliable) to go to Playa Tortugas ( Turtle Beach). With this daily outing the next problem with hotel became clear to me. I have bad knees. To get back to the hotel,one must climb very steep stairs ( lots of them! )or walk 45 degree ramp. It was extremely difficult. Eduardo helped to get me a golf cart to the bus stop. I felt very lucky and grateful. To get back was a difficult task. I think,hotel should organize shuttle to the bus stop and back. With the set times. Another 2 suggestions :1. Construct a shade area next to the pool or increase amount of cabanas. I had 3 times cabana reserved for us by Eduardo,but this is not a point. The shade should be available for everyone who needs it. 2. Look into your Beach cots construction. They have sharp corners. I bruised myself 3 times and cut once while passing next to them. I think,some sort of cover should be on those corners. They are bigger than a cot and stick out. 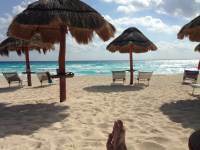 This was our first experience with Paradisus Cancun and Royal Service. I would recommend this service to anyone wanting to have a wonderful, relaxing vacation. Royal service provides pamper service if you're wanting to relax and enjoy spacious and beautiful surroundings. Service with a smile - staff so anticipatory and fine tuned you don't even have to ask. The hotel itself beautiful with well appointed rooms - bursting with activities and many, many amenities and food options. Food selection and flavor is second to none. Something for everyone - every age group, every lifestyle. The hotel itself is 5 star - Royal Service - 5 diamonds without a doubt! Book and enjoy every minute of your stay! Wanted to love it....So disappointed! 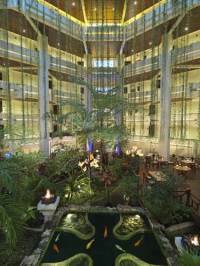 After staying at another Paradisus location I expected the same level of service and luxury. We were in for a rude awakening! Right from the beginning we had issues. We walked into the hotel and there was no one to direct us to check in. As Melia members we had priority check in therefore the line was not outrageous but by the time we were done there were a number of people waiting to be helped. Our reservation was not for Royal Service but we wanted to upgrade. Unfortunately, there were no ocean view rooms for the first night so we stayed in the Paradisus Jr Suite for the first night and moved over the next day. Our Jr Suite was awful! The room was so outdated! There was a pullout couch that looked like it was easily 50 years old and stained. There was one chair in the room which also looked old and weathered. We had ordered room service and noticed that there was no table to put our food down on. The bathroom was ok except for the door separating the toilet from the rest of the bathroom. It was on a track that kept coming off and had a bidet about two feet from the toilet. There was very little room making it awkward and uncomfortable. The next day we were moved to our Royal Service Luxury room. It was heaven! The room was bright with white furniture with a gorgeous bathroom and soaking tub! If you stay at this resort definitely stay in one of these rooms!! 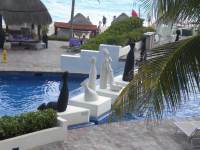 The grounds were well kept including the pool area, beach and common areas.The food at the resort was disappointing. Room service the first night was cold and did not taste good at all. It was all pretty inedible. Once we moved over to Royal service the room service food did get a little better. We ordered other items that weren't as bad as the first night. We ate at 3 different restaurants and finally decided to stick with just one for all of our meals. The last night we ate off the property in order to get quality food.In my opinion the hotel is understaffed. When we called to ask for towels it would take easily 20 to 30 minutes. We had a palapa reserved for the day at the Royal service pool and it took 30 minutes before anyone came over and acknowledged us and another 30 minutes or so before we got our drinks. The day before we went over to the main pool since there were no palapas in royal service. We paid $125 USD for a cabana for the day which included a bottle of choice. This wasn't so bad and the service was much much better. Our server Didi was great! Still disappointing that we had to pay to get good service. As part of Royal Service we had a butler assigned to us. Since we didn't check in to Royal Service until the second night there was some confusion. We were given our key at the main desk and not the Royal Service check in desk. We assumed our butler was the same as another couple friend of ours since we had requested it but we didn't really know and only heard from Hector a couple of times. We definitely did not get what we expected with the butler service. Overall, the resort is not what we expected and I will most likely not visit this location again. 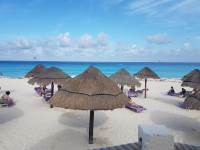 In general, it is a nice trip in Cancun. The sea is blue and the sky is clear, but it's not because of the hotel. 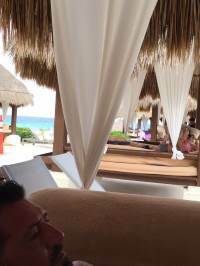 We ordered the royal service at Paradisus Cancun the last two days of our vacation. The hotel is decent according to the money we spent but the service is bad, at least not as good as we expected / they claimed.Service: As they claimed "Unparalleled. All-encompassing. Elevated, preferential and private" for the royal service, I did not feel that. 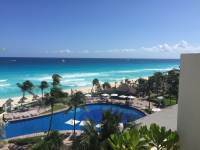 a) We did not have the valet service when we arrived, and I just park my luggage by myself and walked under the burning sun of Mexica. b) Waiting for the check-in a long time. Actually, the royal service has a different place for check-in and it supposed to be that we were led to the place at the moment we arrived. But no one told us about this until I checked in the regular reception and was told to wait for some one guiding us.c) In the check-in, no welcome champagne, but at least two bottles of water. d) They don't have a suitable room for three people, and you will have an extra bed in a King bed room.e) Butler: not as good as it supposed to be. They have a butler service, which looks great to us and different to other hotels. They assumed the butler would be there from morning to night (11 pm) for us and also have guaranteed reservations for specialties. However, when we want to take pictures of our families on the beach and need butler's help at around 5 pm, she was not there. When we need the reservation for the pool bed, she made it but on the waiting list and we still need to reserve it by ourselves at 12 pm at the customs service. When we check out and she promised us would have an agent help us for the luggage, but no one showed up. 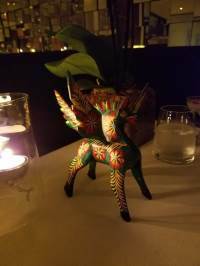 We would only thank that she helped us reserve two dining restaurants and gave us a bottle of Tequila as a gift.Restaurants:Most of them are good, not recommend that Asian Thai Restaurant, highly recommend the Market of Grill and LapaLapa. Nao's is also good. Service in the restaurants was friendly and nice.Facilities:They are good generally, except my small extra bed. We did not have a chance to enjoy the bed beside the pool, no comments.Overall, the hotel is good if you are not supposing to spend money on the Royal Service and want to receive the so-called 'Royal Service', or if you can stay longer (they might ignore us since we just stayed two nights) the situation might be better. 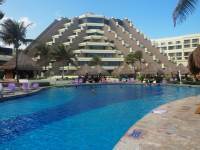 A Great Hotel at Cancun!! 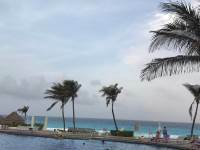 We had an amazing honeymoon at Paradisus hotel, especially with Royal Service upgrade. It is definitely worth paying extra as you are getting an exclusive service which makes your stay unforgettable. Also, our butler Daniel was very friendly and helpful. He answered all the questions that we had and made our honeymoon truly special. Daniel - thank you again. 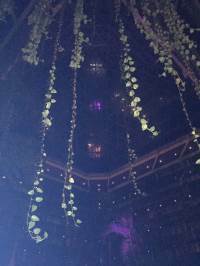 Overall, it is a great hotel where you will definitely get a luxury service and a holiday of your dreams The evening show programme was amazing too! 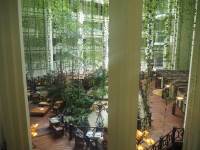 We spent 5 days at the resort and loved the Royal Service. The convenience of having our dinner reservations arranged for us was a big convenience. As was having our breakfast and after dinner drinks waiting for us right outside our door in the wonderful indoor garden. One thing that we did not realize (maybe we should have) was that the Royal Service only included a poolside cabana for 2 days out of the 5. So, make sure you nail that down in advance to get the days you want. On the other days, the beach is right there and very nice. On the last night I did get pretty violently ill with a pretty bad case of Montezuma's Revenge. I only ate at the resort that day, so it was something there. So, a word to the wise to be extra careful even when in the resort. My wife and I had 4 days leave and selected the most expensive option ...the Royal Service. It started really bad with the check in, we arrived at 9pm and took us 30 minutes to be served, only 1 staff on duty. We were supposed to have a butler but it didn't show up to welcome us. Royal Service has an exclusive pool with balinese beds but since the number of clients is largely bigger than the number of balinese you have to inscribe in the waiting list and pray...seems that some clients are more Royal Serviced than others...difficult to understan. 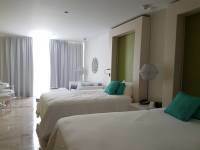 The rooms are great, spacious and very clean but the bathroom is small and needs to be refurbished. The beach is very beautiful and nice and we loved it. 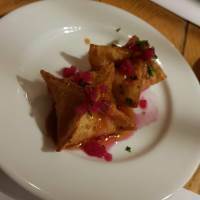 Restaurants are just ok. In my opinion the quality/cost ratio is not adequate. We stayed at Royal Service at Paradisus for 5 nights, it was amazing. 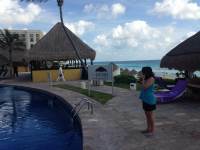 This was our seventh trip to Cancun and we have now found the resort we will always return to. From beginning to end, it was the best service we have ever had. We booked royal service and then upgraded from a luxury suite to a 1 bedroom suite, the room was great, 3 balconies, 2 bathrooms and plenty of room. Maria was our Butler, and she was incredible! She took care of everything for us, from bali bed reservations, dinner reservations and even printed our return boarding passes for the plane. She checked on us during the day to make sure evrything was going well. At the pool / ocean Omar and Carlos, did an amazing job. by day 2, they knew our names and took great care of us, We had great conversations with both of them. Eddie, our server 2 days at the pool and La Palapa Restaurant and one day in royal service for breakfast, was awesome, He went above and beyond to take care of us!Ricardo, our server at the pool one day was great, kept bringing us our drinks, recommended other drinks, every 20 minutes he would check on us if we needed anything. 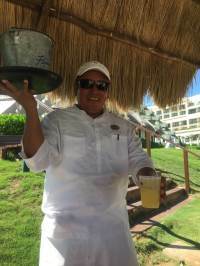 There was another woman (can't remember her name) that was also our server at the pool and La Palapa that also did an awesome job, and went out of her way to always greet us when ever she saw us in the resort. Gabriela was our server every night at Avenue bar, she was great! She was so polite and friendly, we talked with her a lot, she is still learning English and asked if we minded if she talked with us to help her learn, such a wonderful girl. Every staff member we encountered was amazing and friendly and went above and beyond to take care of us. The restaurants are pretty good, We did not try all of them, but here are the ones we did,Naos, is the buffet open from 6:30 am until 11:00pm , very good food and they have cooks making omelettes and eggs to order for breakfast, the cook fresh meats and seafood for lunch, one day they were even cooking Tomahawk steaks for lunch, and at dinner amazing seafood and various meats. Market Grill is attached to Naos and is the outdoor section for breakfast and lunch and for dinner it is a Brazilian Steak House, which is amazing, we liked it so much we ate there twice. 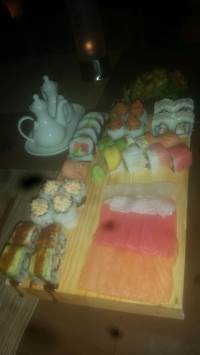 Enso is Asian fusion, we weren't a big fan of the food here, but once again the staff was amazing. Fuego is also excellent, the food and service are amazing, but it does take a long time to eat there, we were at dinner about an hour and forty five minutes, a little longer than we like. The entertainment at night is fun, some nights it is in the Ave bar and some nights it is outside in the main area. The Ave bar gets crowded in front, make your way to the back and there is plenty of room. I can't stress enough to take care of the staff (don't be cheap, TIP THEM), tipping goes a long way. Remember they do not make a lot of money working at the resort, so tips really help them out. I don't think the staff will treat you any different wether you tip or not, but take care of them, they are amazing people that go above and beyond to make sure your vacation is amazing. 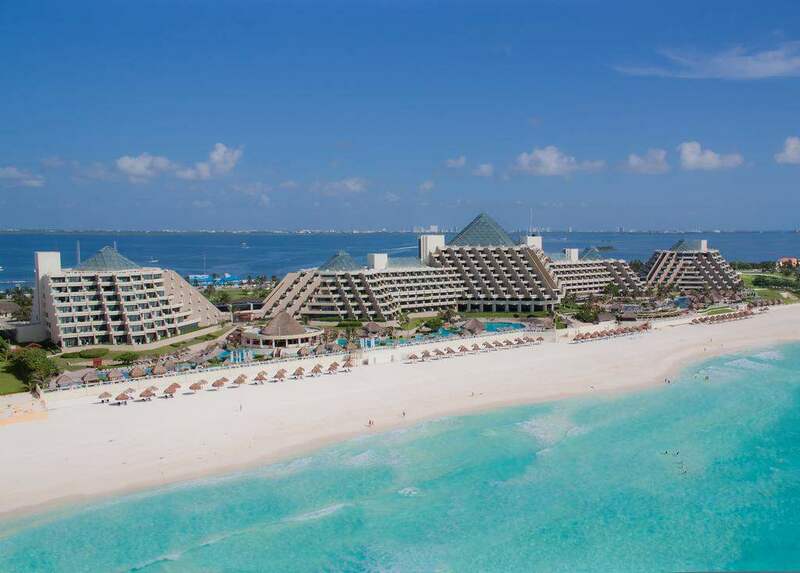 We will now be staying here every time we go to Cancun!! Already planning our next stay!! 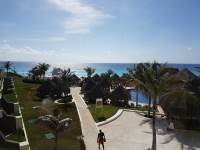 My wife and I enjoyed a long weekend at the Cancun property. 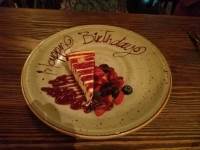 We were belatedly celebrating her birthday and the staff went over and beyond anything we could have imagined to make her feel special from the decorated room to the special touches through out our stay. 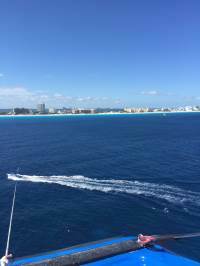 We have not often vacationed at all inclusive resorts and probably would not do it again unless it was with the Royal Service option. The extra service components were certainly worth the additional investment. We had paid for a sea view room. Upon arrival we were upgrade to Royal service. This was wonderful as we had our own butler called Galdino who was excellent. Mirian in the Market Grill restaurant was a fantastic host, so nice and charming. What a lovely lady. The resort for us was faultless. We will definitely be returning. 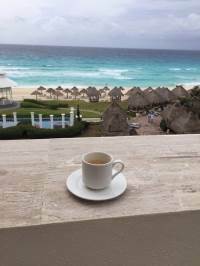 The Royal Service at Paradisus Cancun was such a pleasant surprise. Our Butler, Eduardo, was so accommodating and helpful. Being all inclusive was an extra bonus too because Eduardo delivered a fifth of Jack Daniels to our suite without me even asking for it. We thoroughly loved the Royal Service! 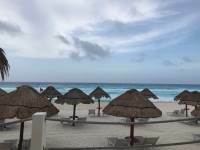 We visited Royal Service at Paradisus Cancun in March 2017 as the first stop on our Mexican honeymoon. 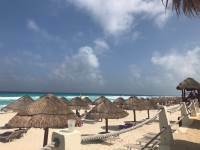 There had been a mix up with the booking as we had originally booked ME Cancun but due to refurbishment we had been moved to Paradisus and as it was a special holiday for us they upgraded us to Royal Service (after some negotiation!!). Luckily Paradisus surpassed our expectations so it all worked out well in the end!The Royal Service area had amazing lounge all day with a buffet that changed throughout the day (breakfast, lunch, nibbles, snacks) and a help yourself bar! 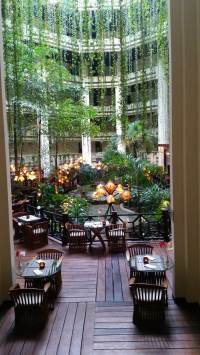 It was quiet so you could relax away from the buzzy atmosphere in the main part of the hotel. The pool area was divine - you get two days guaranteed on a Bali bed and can try to reserve for more days - we managed three. 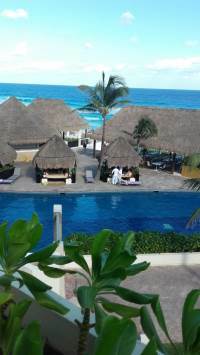 The pool is warm and large, the access to the beach is quick and clean, and the waiter service was most welcome! The staff were all so friendly and welcoming and a couple of days we had live music by the pool with different bands - really helped to get in the holiday spirit!The room was apparently newly renovated and was beautifully decorated, luxurious and comfortable. The bed was amazingly comfy! !Our butler Hector was very helpful - he sorted the booking of our Bali bed and restaurants for us each evening. Most restaurants were very busy and some fully booked so this certainly helped! 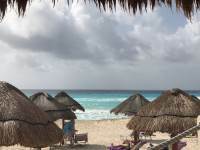 He also helped us with travel tips for the rest of our journey.If we were to go back to Cancun we would definitely save our pennies and stay here again - pure paradise! 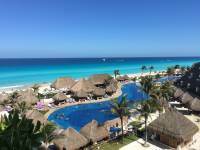 For my birthday I have been going to Cancun for years.Due to Me Cancun resort renovation, my booking this year was transferred to Royal Service at Paradisus Cancun. Lazaro Asencio, the manager of the hotel , made the transfer easy and showed outstanding customer serves (thank you so much Lazaro!!!) Highlights of the resort:Fancy! If one is looking for tranquility - the best place to stay. 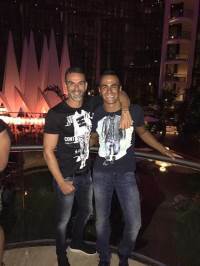 If one needs some fun - a short walk to the main pyramid for the entertainment.Loved exquisite appetizers at the lounge, high quality alcohol drinks, coffee. The best service ever.Nice room.Plenty of free sits at the beach and by the pool.Looking forward to get here next March. 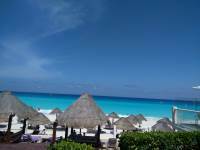 First off, I have never been to Cancun before... but I can tell you I will be returning! The Royal Service at Paradisus Cancun was AMAZING. I felt like royalty. Our butler, Erik, was so kind and sweet. He showed us all the offerings the hotel had, and made sure our stay was everything we hoped for. My friends and I miss Erik dearly!! I highly recommend requesting Erik as your Butler! I was so excited every day to eat at LaPalapa. Our waiters included: Cesar, Jorge, Alejandro, and Josue. Each of them had a smile on their face and was willing to help out in every way possible. They went above and beyond to make sure we were happy with every meal and drink. I miss them! We also did pictures on the beach, and Parvi did an amazing job. She was able to get the best shots while having fun! One of the many activities we did was the Mixology class offered at Bana. We had Gato as our bartender, and he did a fantastic job! We were able to learn how to mix several drinks, and we even had some entertainment. He made sure to include us all in every drink preparation. I am lready planning our trip back next year, and I CAN'T WAIT! The service was exceptional All the staff we encountered were courteous, accommodating and friendly. The ocean view junior suite room was spectacular. We had the Royal service so the room was cleaned in the morning and then turn down service with fresh towels and aromatherapy in the evening. The food was very good in all the restaurants. Reservations were made by our butler for each night. Pool was very clean and we had no problem getting a cabana and lawn chairs in the adult only section. The Paradisus Royal Service was a great stay! I would highly recommend it for couples vacationing without children! The pools are amazing! The beach was beautiful and the service outstanding! 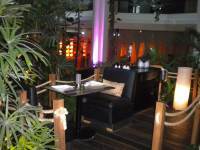 There are a wide variety of restaurants, evening performances and spa treatments! 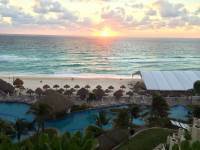 It is definitely one of the top resorts in Cancun! 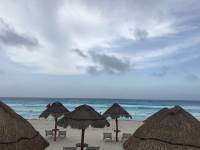 My husband and I were looking for a quiet, peaceful getaway and the Paradisus delivered! Highly recommend the Royal Service. Gerardo was our butler and he did a fantastic job. We did not have to worry about anything - he took care of our reservations at the restaurants every night, reserved our bali bed for us and filled us in on different activities daily. One day we came back to our room and there was a bottle of champagne and chocolate covered strawberries waiting for us in our room. All the employees were so friendly and so helpful. They really wait on you at the pool or if you are sitting at the ocean. Bring you a bucket of water, beverages, food nonstop all day. Eddie C. took good care of us poolside. Never went thirsty or hungry. Carlos worked the pool area and really took care of us also. 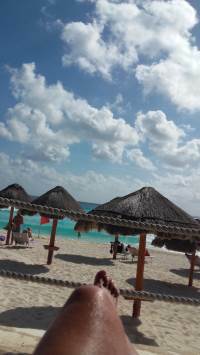 We've been to Riviera Maya, Playa Del Carmen, Akumal. 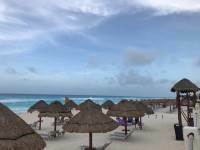 First time in Cancun and the beaches and water here are fabulous - wish we would have tried Cancun long ago. The food at the Paradisus was very good. Being in the Royal area we only at the buffet one morning for breakfast and that was the typical buffet at an all inclusive. Breakfast outside at the LaPalapa Restaurant was wonderful. Could order a la carte. All the restaurants we ate at were very good, Mole, Fuego, Enso, Blue Agave Restaurant and Market Grill. We were looking for a relaxing getaway but if you wanted more activity the resort is so big you could find an area with more going on. We will definitely come back again. ROYAL SERVICE IS THE WAY TO GO. . .ABSOLUTELY AMAZING FROM START TO FINISH!! 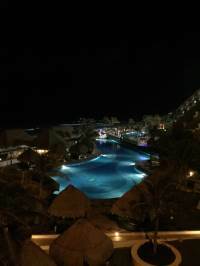 This was our second trip to Cancun and it was phenomenal!!! 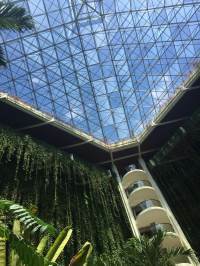 Upon arrival at the hotel, there were staff everywhere guiding guests and making sure that their luggage would be taken care of and we were immediately escorted to the check-in lobby. We originally had booked a regular lagoon view room but after reading all the rave reviews about Royal Service I kindly asked if there were any RS rooms available and he said that it's "extremely popular and sold out" but that he'll check. After a couple minutes, he said an oceanview room in the Royal Service tower was available and that it would be an additional $150 a night. I said "YES!!." He immediately called our butler, Eduardo to whisk us away to the exclusive Tower 5 (where all Royal Service guests stay). Plus NO KIDS!! !Royal Service guests have a lounge downstairs in Tower 5 that serves top shelf liquor, drinks and snacks all day. 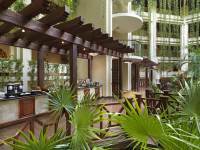 A private pool area with use of Bali beds and priority reservations at all the restaurants. 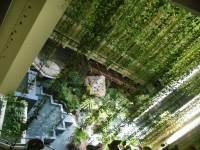 He personally brought us to this sanctuary, away from the hustle and bustle of the main hotel. 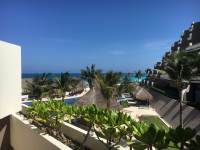 We were brought to a special priority check-in desk and the lady kindly told us that our room wasn't quite ready so Eduardo told us that we could have lunch at "La Palapa." 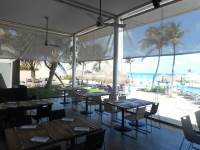 This is the exclusive restaurant for Royal Service guests that overlooks the beach that serves full breakfast and lunch. 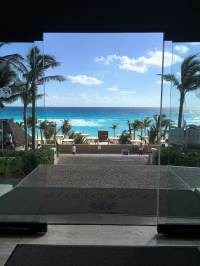 When our room was ready, Eduardo escorted us to our room overlooking the ocean and he walked us through all the room features and how to reach him throughout our stay. This room was newly renovated too!! All white with bright pops of green plus a mini fridge that was replenished daily. We especially enjoyed the Nespresso machine for our morning coffee. Any request we needed from extra pillows to towels was answered quickly. I do have to say that the Royal Service is the way to go if you don't want to be around screaming kids by the pool all day. Our first full day we had a Bali bed plus two sun loungers. There's a pool concierge that will help you set up and give you towels. Props to Omar for helping us secure beds the whole week! He was AMAZING!!! This pool area is like a slice of heaven. Sooo quiet and relaxing as opposed to the main pool area after the glass doors where it sounded like spring break with loud music pulsating. The beach constantly was red flagged but that didn't stop us from swimming! It's like a giant wave pool. . . just don't go out that far and you'll be fine. I think what stands out the most is the staff at the hotel. Everyone from check-in to check-out went above and beyond to make sure we were taken care of. The staff at Royal Service truly made our stay memorable and enjoyable. 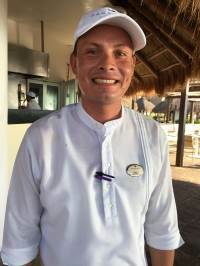 Too many names to name but Eddie C, Ricardo, Rafael, Eulisis, Valeria, Alejandro, Octavio all really really worked hard to provide 5 star service. I do have to say that Eddie C was a superstar and took care of us by the pool all week!! He would bring us bottled waters and kept the drinks flowing without us asking!! Also to Orlando at the Naos buffet who had our mimosas ready for us without asking!! I know that this an all inclusive resort and I was appalled to see some guests not even tipping!! These people work hard and we tipped everyone every day! It was worth every penny.We basically tried all the restaurants and our least favorites were Bana and Vento. Bana is their Japanese restaurant but coming from California we didn't really have high standards for sushi. Don't get me wrong the flavors were good and the fish was very fresh! Vento was tapas and it was just okay. Enso which as Asian fusion had really good flavors but the chicken was a little overcooked that night. Our favorites were Mole (best Mexican food!! ), Blue Agave (tacos) and Fuego (steakhouse)!!! The service at all the restaurants were top notch! If you really want a luxurious vacation with no kids Royal Service is the way to go! The private pool area alone is worth every dollar. 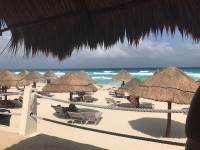 I can't say enough about the staff and we can't wait to come back to Cancun and stay here again! I am so glad we booked Royal Service. 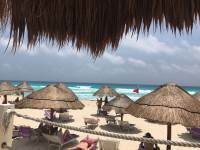 The beach is gorgeous and eating by the beach in La Palapa restaurant is one of the best things in life. The food is always fresh and delicious. The green juice is a must try! And who would think that they would Churn out the fluffiest pancakes ever?!? I wish they were open for dinner too! The lounge is excellent with delicious treats all day! Our butler was helpful and the staff is great. 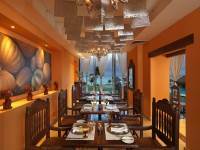 Our favourite restaurants are Tempo, Vento, Fuego and Blue Agave. Blue Agave is so simple and tasty. Ask for the habanero sauce if you need some kick on your tacos and for goodness sake try the Alabmbre tacos as they are delicious! Highly recommend this as the pool, daybeds, beach and Service make for a perfect relaxing and unwinding vacation. 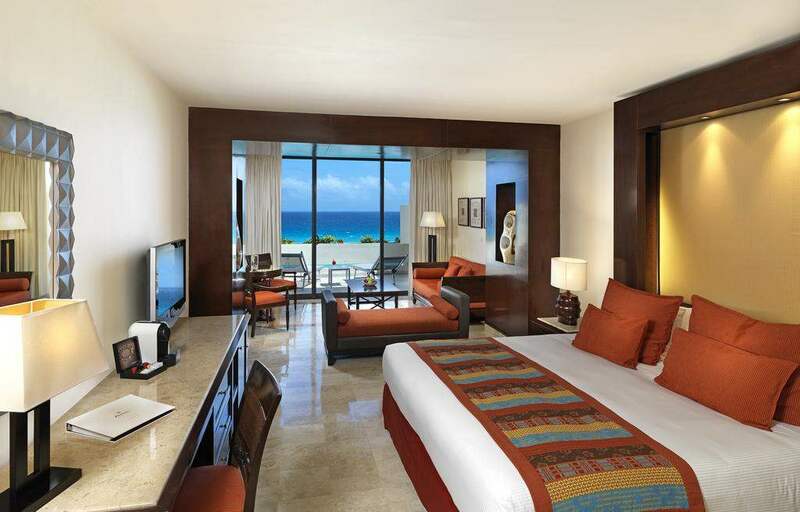 We purchased a Lucky Five package through Sunwing Charters for a five star hotel in Cancun. Without a length explanation, you pay the set price (flights & hotel) and wait to find out which one of nine 5 star hotels you'll be staying at. 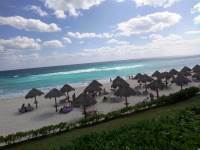 We just returned from our week vacation to the Paradisus Cancun and it was wonderful. We upgraded to Royal Service ($70 USD / room / night / lagoon view) where we had our own section of the hotel (quiet), adult only, 24 hour communal bar, butler, huge pool, bali beds, outdoor restaurant and beach palapa's. 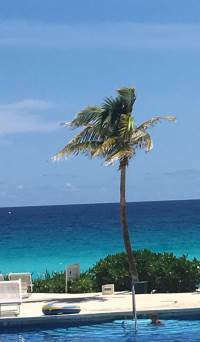 The ocean is spectacular, the sand is a white powder that never heats up and there is no coral to step on while swimming. 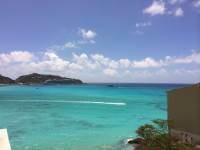 If you want snorkeling, take a tour from the hotel. The Royal Service gives you front of the line reservations at the restaurants (made by our butler) and the food in these restaurants is astounding. 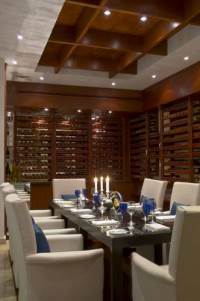 People are different when it comes to food preferences but I'm confident there's a restaurant in the Paradisus Cancun that will suit your taste. 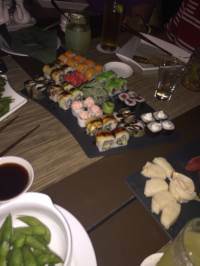 For us, the seafood and sushi was the best we've ever eaten anywhere. The pace that portions were served at was just right to allow you to enjoy the variety of flavors and textures. I would recommend this hotel for the food alone but there was so much more. The staff were phenomenal, our butler Eduardo was extremely respectful of our privacy yet was immediately available if you needed anything. We were assigned cell phones to contact him directly and he worked tirelessly for us. Valeria at La Palapas (outdoor restaurant) was our favorite server who would serve us the most amazing breakfast and lunch at La Palapas. Valeria ALWAYS made sure we had everything we wanted and if there was the slightest problem she made it right. All the servers were phenomenal, constantly bringing water, drinks and food to your bali beds or palapas overlooking the pool or ocean. I just can not say enough about the hotel and restaurant staff. Our room was a lagoon view rather than the ocean side, lesser cost and not as spectacular a view but we only spent the evening there anyway. The evening entertainment varied, ranging in taste from latin to pop but be sure to get there by 7:30 pm or seating may be an issue. The central portion of the hotel is the loudest with most activities centered there while the Royal Service section was very quite, exactly what we wanted to relax.